Gentleness is everywhere in daily life, a sign that faith rules through ordinary things: through cooking and small talk, through storytelling, making love, fishing, tending animals and sweet corn and flowers, through sports, music and books, raising kids — all the places where the gravy soaks in and grace shines through. 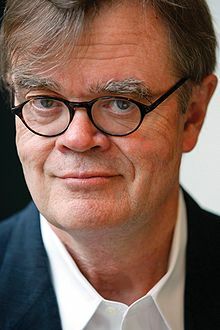 Garrison Keillor (born 7 August 1942) is an American novelist, humorist, comedian, and public radio personality. If the government can round up someone and never be required to explain why, then it's no longer the United States of America as you and I always understood it. Our enemies have succeeded beyond their wildest dreams. They have made us become like them. God writes a lot of comedy, Donna; the trouble is, he's stuck with so many bad actors who don't know how to play funny. Lake Wobegon, where smart doesn't count for so much. A minister has to be able to read a clock. At noon, it's time to go home and turn up the pot roast and get the peas out of the freezer. Nothing you do for children is ever wasted. They seem not to notice us, hovering, averting our eyes, and they seldom offer thanks, but what we do for them is never wasted. It was luxuries like air conditioning that brought down the Roman Empire. With air conditioning their windows were shut, they couldn't hear the barbarians coming. The funniest line in English is “Get it?” When you say that, everyone chortles. To know and to serve God, of course, is why we're here, a clear truth, that, like the nose on your face, is near at hand and easily discernible but can make you dizzy if you try to focus on it hard. But a little faith will see you through. What else will do except faith in such a cynical, corrupt time? When the country goes temporarily to the dogs, cats must learn to be circumspect, walk on fences, sleep in trees, and have faith that all this woofing is not the last word. What is the last word, then? Gentleness is everywhere in daily life, a sign that faith rules through ordinary things: through cooking and small talk, through storytelling, making love, fishing, tending animals and sweet corn and flowers, through sports, music and books, raising kids — all the places where the gravy soaks in and grace shines through. Even in a time of elephantine vanity and greed, one never has to look far to see the campfires of gentle people. Cherish the Minnesota State Fair. Wherever you find beauty and simplicity and truth, know that there is a committee somewhere planning to improve it --- don't let them do it. To many Americans, whose only knowledge of the North Star State is that it is intensely cold and populated by Swedes and Holsteins, it will come as a surprise to wake up one morning in 2004 and read in the newspaper, "Half of U.S. Economy Now in Hands of Minnesota". One day Donald Trump discovers that he is owned, lock, stock, and roulette wheel, by Lutheran Brotherhood, and must renegotiate his debt load with a committee of silent Norwegians who don't understand why anyone would pay more than $120 for a suit. Where I'm from we don't trust paper. Wealth is what's here on the premises. If I open a cupboard and see, say, thirty cans of tomato sauce and a five-pound bag of rice, I get a little thrill of well-being — much more so than if I take a look at the quarterly dividend report from my mutual fund. The party of Lincoln and Liberty was transmogrified into the party of hairy-backed swamp developers and corporate shills, faith-based economists, fundamentalist bullies with Bibles, Christians of convenience, freelance racists, misanthropic frat boys, shrieking midgets of AM radio, tax cheats, nihilists in golf pants, brownshirts in pinstripes, sweatshop tycoons, hacks, fakirs, aggressive dorks, Lamborghini libertarians, people who believe Neil Armstrong's moonwalk was filmed in Roswell, New Mexico, little honkers out to diminish the rest of us, Newt's evil spawn and their Etch-A-Sketch president, a dull and rigid man suspicious of the free flow of information and of secular institutions, whose philosophy is a jumble of badly sutured body parts trying to walk. Well, they're taking kids out of the country and sending them over there, National Guard kids and Army Reserve. They're sending kids who are barely prepared for this, and they're sending them over there to kill people, which is a serious thing. And to kill not terrorists, but to kill insurgents. I sort of find myself in agreement, uncomfortably, with Patrick Buchanan, who writes about this in his book, Where The Right Went Wrong. And writes that great powers, the way they skidded off the road, was getting involved in wars. That it's the role of great powers to stay out of wars. To the cheater, there is no such thing as honesty, and to Republicans the idea of serving the public good is counterfeit on the face of it — they never felt such an urge, and therefore it must not exist. Journalism is a good place for any writer to start — the retailing of fact is always a useful trade and can it help you learn to appreciate the declarative sentence. A young writer is easily tempted by the allusive and ethereal and ironic and reflective, but the declarative is at the bottom of most good writing. None of the men and women who voted for this bill has any right to speak in public about the rule of law anymore, or to take a high moral view of the Third Reich, or to wax poetic about the American Idea. In electronic publishing, they're are no editors and if their are there not very good. The word “loser” is spoken with such contempt these days, a man might like to forget the losses in his own life that taught him something about good judgment. The money he invested in that casino in Atlantic City that went bust, the university course he enrolled in that promised to teach him the secrets of success but instead he wound up unemployed and 40 grand in debt, the candidate whose hat he wore who turned out to be tone-deaf and deluded — dumb, dumb, dumb, and yet his loved ones did not chortle and point and do the nyaa-nyaa. They put an arm around him and said, “This is how we learn.” And it is. We made our mistakes back in the 20th century, Lord knows, but we never nominated a man for president who brags about not reading. Calvin Coolidge had his limits. Warren G. Harding spent more time on his hair than strictly necessary. Lyndon Baines Johnson was a piece of work. But all of them read books. When I envision a Trump Presidential Library, I see enormous chandeliers and gold carpet and a thousand slot machines. God help us. I mean it. We’re in trouble down here. That's the news from Lake Wobegon, where all the women are strong, all the men are good-looking, and all the children are above average. Librarians, Dusty, possess a vast store of politeness. These are people who get asked regularly the dumbest questions on God's green earth. These people tolerate every kind of crank and eccentric and mouth-breather there is. See also the Wikipedia article on the Lake Wobegon effect. Going to church no more makes you a Christian than standing in a garage makes you a car. 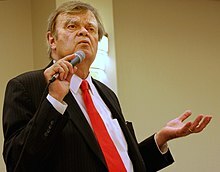 Though Keillor has been quoted on the internet and in print as having made this or a similar remark, such expressions have been made by others, and may have originated with Billy Sunday, who is quoted as having said "Going to church on Sunday does not make you a Christian any more than going into a garage makes you an automobile!" in Press, Radio, Television, Periodicals, Public Relations, and Advertising, As Seen through Institutes and Special Occasions of the Henry W. Grady School of Journalism (1967) edited by John Eldridge Drewry. A book is a gift you can open again and again especially when you're writing it yourself.